What kind of therapy does AEIOU deliver? AEIOU Foundation delivers intensive supports for children with an autism diagnosis, who are aged 2 - 6 years. All therapy plans are individualised, and children receive therapy witihin small groups, or in a 1:1 setting if required. Within one location, children access speech pathology, occupational therapy and behaviour therapy. Skilled educators and learning faciliators also specialise in autism, and aide in the consistent delivery of therapy. Therapy practices are evidence-based and quality assured, ensuring all centres offer the same, high-quality service. 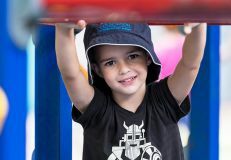 Each child has individual strengths and needs, so upon enrolment, children will be assessed and an Individual Plan (IP) will be established to support your child while they engage in the program. Parents are kept informed and are encouraged to contribute to this process. Families may also access a range of information, advice and workshops to ensure the family unit is supported. AEIOU operates 48 weeks each year on an intensive basis. Fees for the service are spread evenly across these weeks. How can I manage my NDIS funded supports? If the Early Childhood Planner/Coordinator determines that your child requires a NDIS plan, the Early Childhood Planner/Coordinator you will ask how you would like to manage the funded supports. Agency Managed (the NDIS manages your funds. We find most of our families choose this method as they find this the easiest). AEIOU submits a claim for the services they have provided to your child and the NDIA then pays AEIOU. You are able to track any claims made by service providers on your NDIS portal account. Self-Managed (you are responsible for managing your funded supports and keep track and records of all expenditure). Provider Managed (you may elect a third party to manage your funded supports. In this instance, you provide the expenses to the provider and they make the payments for you). Do I need to take a quote to my NDIS planning meeting? No, you do not need a quote from AEIOU, or your chosen therapy provider, before attending your NDIS planning meeting. The best thing you can do to be prepared for your meeting is to have a clear understanding of what level of support your child needs (for example, does your referral letter from your paediatrician state the level of the autism diagnosis?). Children with a level 2, or level three autism diagnosis will best benefit from 20 hours of intensive early intervention per week, for 2 years. This is reported in the Australian Guidelines for Good Practice (2012), and in a report released by the NDIS in 2015 (Roberts, Williams, Smith & Campbell). Talk to your planner about your child's need for intensive support, and consider the goals you have for your child broadly and specifically. For example, within the domain of communication, increasing social skills, indpendent living and self-help skills, behaviour support, and so on. You can also think about community access and safety issues; do you need assistance to access swimming lessons, for example? You may also consider whether you need respite, or assistance with resources such as nappies, learning tools, etc. It's a great idea to tell your planner if you think you have chosen a service provider, but do not ask for funding for a service provider. All plans and packages are based on the supports you need for your child, so it's best to stick to facts such as how many hours, and what level of intensive support you need. How is therapy delivered on a day-to-day basis? AEIOU centres open from 7am to 5pm Monday to Friday to provide specialised care outside of our intensive therapy times. Intensive therapy supports are delivered between 9am- 2:30pm, daily. It is essential children arrive on time. 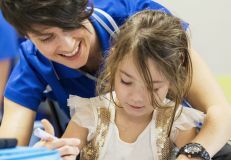 There is a structure to the day, and each child is supported with therapy to develop the skills their parents have identified as a priority, and the goals set by their families with their NDIS planner and therapy team at AEIOU. Therapy occurs in small group settings, and if required, on a one to one basis. Children are encouraged to develop a range of skills, including communication skills, social skills, play skills and self-help skills. Therapy takes place within numerous settings, including circle time (where children are encouraged to learn and use their ‘visual schedules’ to understand the day’s activities). They join a number of learning centres to assist with social and emotional learning, peer interaction, turn taking, role play, language and communication, sorting and matching, and outdoor experiences, to name a few. Toilet training is an important element for all children. Each child is assessed when commencing, and if the child is ready to begin toilet training this will become a priority within that child's plan. How much will it cost to access therapy at AEIOU Foundation? AEIOU structures its fees to ensure childrne receive high-quality therapy while offering good value, ensuring it is as affordable as possible for all families. Every family’s out of pocket expenses can differ based on income and the subsequent rebates they are eligible to access. Intensive therapy supports are directly funded by the NDIS (where applicable). Specialised care on either side of the intensive therapy is offset with the Child Care Subsidy. AEIOU families can apply for financial assistance through the Lynn Wright Memorial Fund. Contact our parent liaison team on 1300 273 435 for more information. Do I have to access AEIOU full-time, on a five-day per week basis? The Australian Good Practice Guidelines (2012) states children benefit best from 20 hours of early intervention per week. In line with this, AEIOU recommends families enrol on a full-time basis to start, with the opportunity to review the enrolment in six or 12 months. AEIOU will support part-time placements where possible, particularly in regional centres. A part-time enrolment means a child attends the centre on a regular five-day fortnight, with three days in a row one week, and two days in a row the following week. How long does it take to develop a child’s individual plan? Each child begins receiving intensive therapy immediately, however, their individual plan may take around eight weeks to complete. Each child will undergo an assessment upon his or her enrolment, and once a child starts at the centre, our team will get to know each child better and identify their strengths and needs to inform the key developmental goals. An Individual Plan will then be created and be implemented within the framework of the program every day, with regular reviews. How is therapy delivered at AEIOU Foundation & what outcomes can I expect? Each child has access to support from disciplines including behaviour therapy, occupational therapy and speech pathology. Children receive group therapies on a daily basis, and therapy strategies, tools and tactics are imbedded into the program, with all staff receiving regular training. What this means is that even when a therapist is not with a child, the team is delivering therapy through every aspect of the program. Therapists at AEIOU do not operate under the traditional 1:1 withdrawal method, although on occasion your child may receive individual support if required. The therapists share their time across all classrooms and children are encouraged to generalise their new skills with a variety of staff and within a naturalistic environment. Every child’s strengths and needs are different, but each team is expected to be dedicated to supporting each child to meet a number of important goals and milestones. Studies show that children who complete the two-year program at AEIOU Foundation experience a reduction in autism symptoms, and over 70% of children transition to mainstream schools. However, AEIOU work with families to identify the best learning environment for their child prior to the transition process. Our team is both professional and caring and it is important to us that children are learning in a fun, rewarding and social environment. We approach behaviour positively and proactively and strive to create a strong foundation for communication, self-help skills, academic learning and motor skills. We keep families updated about the progress of their child, and adjust goals accordingly. For more information about the kinds of outcomes to expect, speak to the centre manager during the creation of the Individual Plan. How are families involved in the AEIOU program? Families can access a number of workshops and training sessions throughout the term to assist with supporting their child at home. Workshops may be hosted by the therapy team in the centre, or by a visiting senior therapist or clinical manager. We encourage families to be actively involved at a centre level, recognising the more a family can incorporate strategies from the program into the home setting, the more successful the intervention will be. Teachers ensure this is balanced and there are not too many demands placed on each child. Parent forums are held at least once per term, and parents are encouraged to attend, to raise any issues, concerns or initiatives they would like to address or implement. Families might also choose to support AEIOU Foundation by sharing their family story, or by participating in events or promotions. Many volunteer to assist the parent fundraising committee, or other fundraising activities, and if so, are supported by a central office representative. However, please note this level of support is not essential or expected.